A nuclear power reactor under construction near the southern South Korean port of Busan, February 5, 2013. Jordan's Nuclear Regulatory Commission has given the go-ahead for a first nuclear research reactor as the desert kingdom, which lacks any oil, seeks to meet its energy needs. The Korean Atomic Energy Research Institute and Daewoo Engineering and Construction Co. will construct the reactor. The five-megawatt reactor will be built at the Jordan University for Sciences and Technology near the northern city of Irbid, commission chief Majad Hawwari said. "The approval of the project came after two years of studies and examination," Hawwari said in a statement. The Korean Atomic Energy Research Institute and Daewoo Engineering and Construction Co. will construct the reactor, which is scheduled to become operational in 2016, he added. "The reactor will help the commission build expertise and capabilities to prepare for constructing nuclear power plants in the future," Hawwari said. 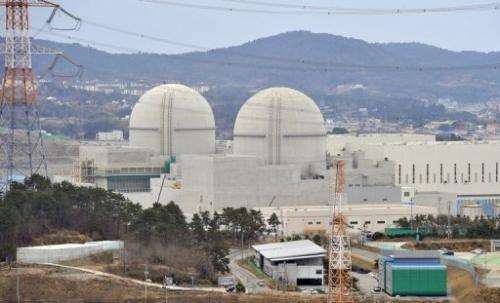 Jordanian officials have said the reactor will cost $130 million and that South Korea has loaned $70 million. Amman is currently weighing rival bids to build the reactor by Russia's Atomstroyexport and a consortium led by French nuclear giant Areva and Japan's Mitsubishi. With desert covering 92 percent of its territory, the kingdom is one of the world's 10 driest countries and wants to use atomic energy to fire desalination plants to overcome its crippling water shortage. Importing 98 percent of its power needs, Jordan also wants to develop nuclear technology to meet its growing energy requirements. But the technology remains deeply sensitive in a region where Israel has an undeclared monopoly on nuclear weapons and Western governments have strong suspicions that Iran has an ambition to rival it. "In August 2012, a senior cleric and Tehran's provisional Friday Prayers Leader Ayatollah Ahmad Khatami, speaking about Qods Day, called for the annihilation of the "Zionist regime," emphasizing that the spread of the "Islamic Awakening" in the Middle East "heralds annihilation of the Zionist regime."